3. First high-quality HEX-shaped co-poly available at a cost of less than $9.00 per set. Construction: New Generation poly-based string extruded in a Hexagonal form. 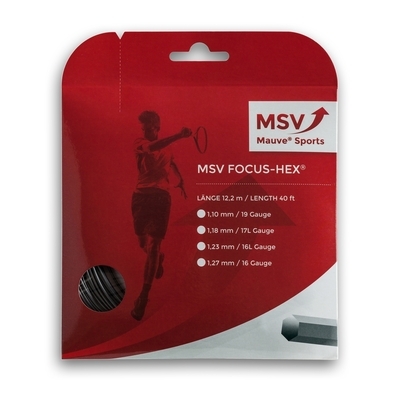 Advantage: This poly-based string offering features solid tension maintenance and long lasting performance but the most exciting advantage of this string is simply, "SPIN POTENTIAL." Playtesters describe this string in all gauges as "phenomenal" in regards to spin. With the 1.10mm version, this may actually be an understatement! In addition to spin and ability to hold it's playability, this string is also extremely comfortable. German lab tests have shown it to be superior to leading brands in the categories of elongation and elasticity. This leads to added comfort, power and all-around solid performance. Why we carry this string: Arguably this string offers the best price to performance ratio of any string. Outstanding performance at a reasonable price. I figured this string would give me some extra spin, but I never imagined how much more spin I would receive. Plus it is comfortable with good power. The red looks great in my 6.1. Love this string. Reviewed Sat, Aug 07 2010 1:13 pm by Marcus B. The only comment that needs to be listed here is simply this: This string is the best that has ever been been produced in the history of the tennis world-Period. Reviewed Fri, Apr 22 2011 5:54 pm by Barry-Fischer Magnetic Comp 95@52lbs. MSV & Jet - crazy results! !